For seniors who are healthy and active, the Independent lifestyle at our Southern Magnolia Iuka community offers many wonderful advantages. This situation is designed for seniors who are capable of maintaining their full independence, but desire the conveniences, social activity and security that community living offers. The privacy and comfort of your own Independent Villa, but with recreational, educational and social opportunities in our main assisted living community. 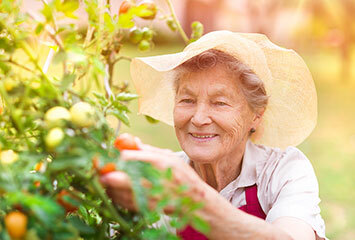 It also allows seniors more time to themselves and less time performing home maintenance and yard work. It’s a great place to entertain old friends and meet new ones. Make yourself at home with your own furnishings and décor and have the benefit of a maintenance-free lifestyle. Enjoy a cup of morning coffee on your covered front porch or back patio. Our Independent Villas offer two bedrooms, one bath with all appliances including a full size washer and dryer. All utilities as well as cable are covered in your monthly rent. You can also customize a plan to suite your needs by adding additional services such as meals, housekeeping, medication management and wellness checks.